Hey there. Wow, it’s been a little while, huh. At about 7pm on the 30th November (early!!!) I frantically typed my last 100 words, and then 100 more… and stopped at 50,100 ish, Broken and shattered, my hands cramping and my inner writer shouting at my inner editor ‘I told you I could do it!’, I stared at the word document in awe for a moment. Then I punched the air repeatedly. Then I backed it up on my flash drive, put it in my dropbox folder, and emailed it to myself. You never can be too careful, huh. 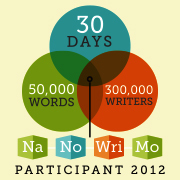 Over the past 30 days, I had been under the word count, nearly every day. My goal was 1667 every day, but that didn’t happen. 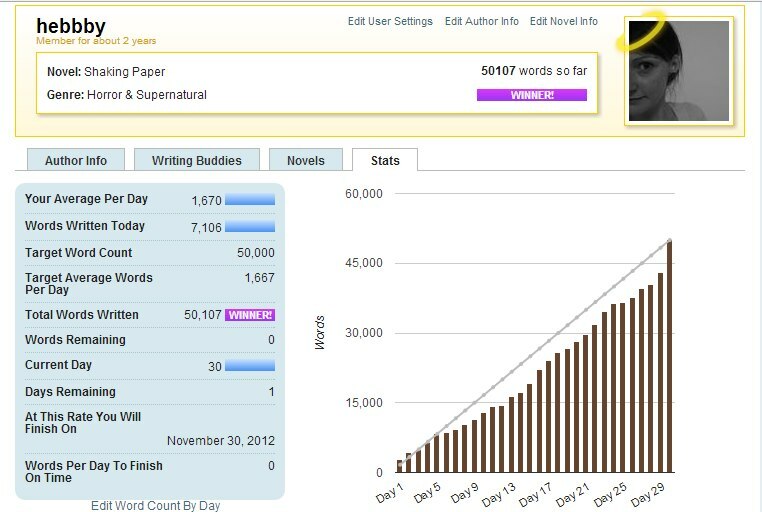 At the weekends I managed to catch up with 2000 a day, 3000 a day, but by the last day I was still behind by a ridiculous 7000 words. Something in me told me I had to do it. I couldn’t just give up. There were 43,000 words behind me, 7000 was nothing. I had the whole day off, and so I typed, pretty much continuously. Editing, however, has been a completely different story (haha is that a pun there… is it?). Well… ok editing hasn’t begun yet. I was meant to do it this month, February, but I think I’ve subconsciously pushed it to one side. I need to do it though. All that work I put in, I can’t let it go to waste, however awful it is.